San Francisco's newest venue, located on Franklin near City Hall, is the SFJazz Center which opens January 23rd with "a star-filled line up “consecrating” the stage of the Robert N. Miner Auditorium." Hosted by Bill Cosby, the concert will include pianists McCoy Tyner and Chick Corea, saxophonist and long time SFJazz Collective alum Joshua Redman, legendary vibraphonist Bobby Hutcherson, Esperanza Spalding, Mary Stallings, John Handy, Pete Escovedo, the SFJazz Collective, and the new SFJazz Center Resident Artistic Directors Regina Carter, Bill Frisell, Jason Moran, John Santos and Miguel Zenón amongst other special guests. This one-time-only gathering of jazz stars will be at the center of the Opening Night celebration, which will include pre- and post-parties to celebrate the opening of the first stand-alone building for jazz in America. If you don't have tickets to this sold out show, fear not- NPR will be streaming the concert live WWOZ, WBGO and NPR Music will team up for a live radio and online video broadcast of the concert, (http://www.npr.org/event/music/169066093/live-from-sfjazz-center-opening). According to NPR's website, "Thirty years after presenting its first concerts in San Francisco, the organization SFJAZZ has built a permanent home and performance venue. 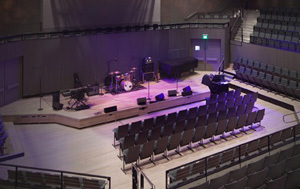 The SFJAZZ Center, conceived as the first stand-alone building for jazz in the U.S., opens with a star-studded concert on Wednesday, Jan. 23, 2013 at 11 p.m. ET/8 p.m. PT."